Indulge in breathtaking views of the sound at Pamlico Sunsets, this great soundfront home is a fantastic getaway destination for you and your family. Enjoy stress-free move in with the convenient elevator to all levels easily accessible in the ground level garage area, the ideal place to keep all your watersports gear and beach toys. On the ground level, the queen master bedroom and a private bath has direct access to a shaded deck with stairs to the back yard. All bedrooms throughout the house have TVs. 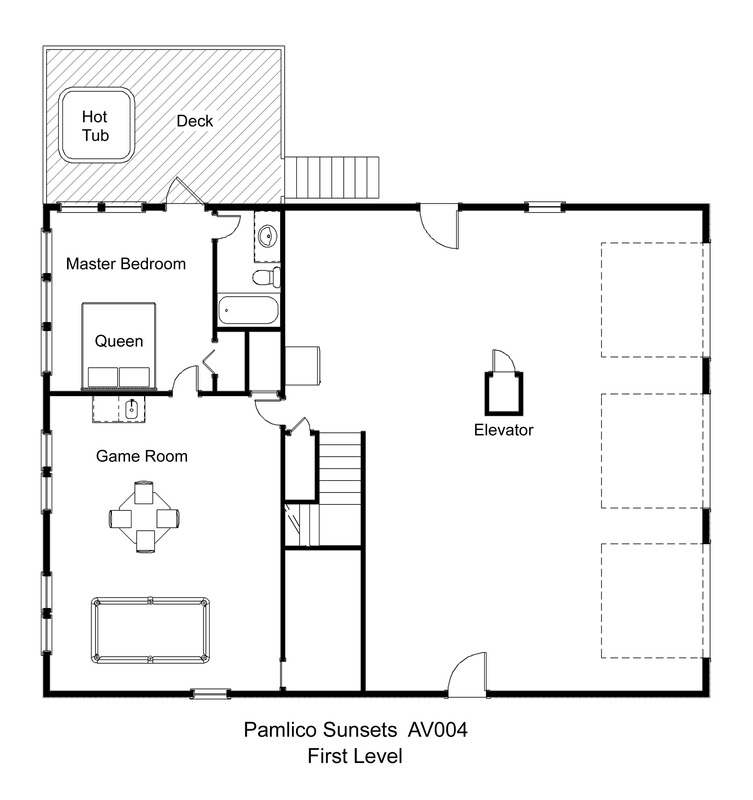 Hang out in the hot tub or have some fun in the game room with pool table, TV, and wet bar with mini-fridge. 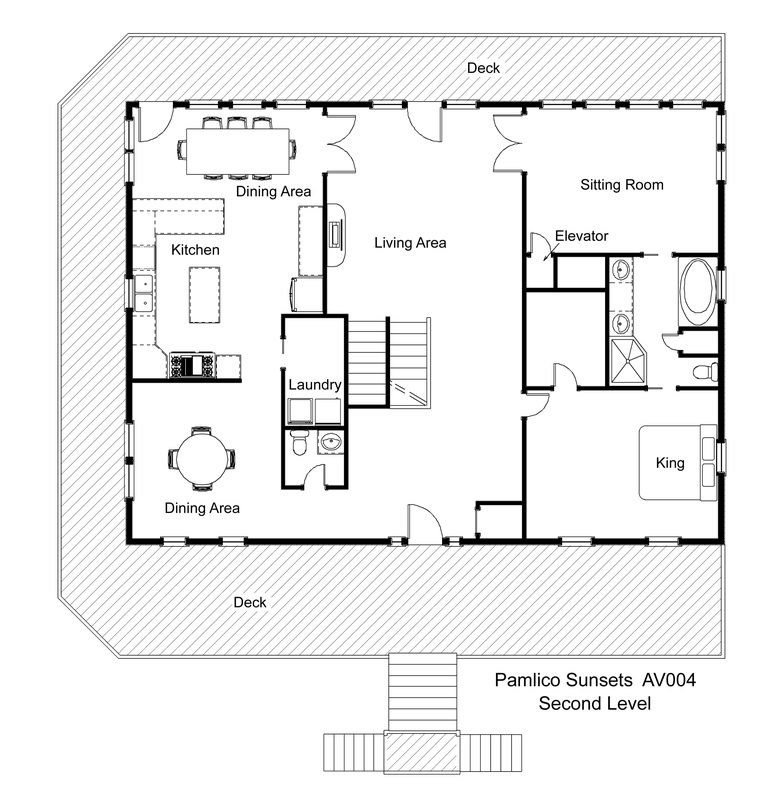 The roomy kitchen and dual dining areas on the middle level offer plenty of space for family meals. Complete with an extra-large gas stove with double oven, this area is full of conveniences for everyone, with custom cabinetry, ample granite counters that include a desk area, and a spacious walk-in pantry closet with washer and dryer. Cozy up in front of the gas fireplace in the spacious living area during cooler winter months, sip sweet tea on the wide covered porch across the front of the house, or soak up some rays while enjoying the view from the large soundfront sundeck. A king bedroom on this level has a semi-private full bath with Jacuzzi tub and custom shower stall, and is also accessible from the sitting room. A half bathroom completes this level. 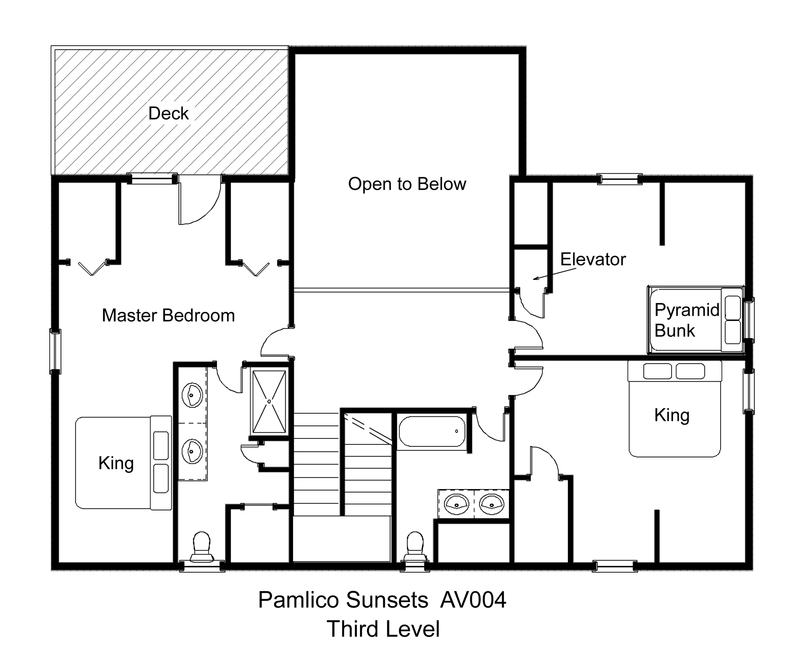 Upstairs, the king master suite has a full size crib and boasts a private soundfront sundeck. With high chair, booster seat, and babygate also provided at the house, this is the perfect home for baby's vacation. Another king bedroom and a pyramid bunk bedroom with trundle share a full bath off the hallway. Take in the gorgeous sound view from the balcony overlooking the living area. Outside, the large grassy yard is perfect for rigging and launching, with sound access just steps from the door. Spend summer afternoons on the water kayaking, kite-boarding or simply exploring. Set back off the beaten path in the Avon Village neighborhood, this gem of a home is the perfect place for walks or long bike rides around the back roads. Enjoy the Kinnakeet Shores pool and tennis courts or use the provided Klub Koru Gold pass which includes fishing and sightseeing at the Avon Pier and daytime access to the oceanfront pool at the Beach Klub. From sunup to sundown, Pamlico Sunsets will be your go-to choice for vacation fun year after year. That means that sheets are provided for all full week stays between May 26, 2018 and September 7, 2018. Beds will be made on check-in day with the exception of top bunks, sofa beds, trundles, and futons (these sheets will be left in the cottage for you). Hello, wanted to ask if we could bring 3 dogs, they are non shedding Shih Tzu’s, house trained and about 12 lbs each. Our standard pet policy for pet-friendly homes is no more than 2 pets, so you would need to contact the office and speak to a Property Manager. Does the property supply beach chairs and an umbrella or is this something we will need to bring/rent? This home is spacious, beautifully decorated and well-cared for. For a big house, it's very homey. The rooms are large, but welcoming. It has every amenity. (It did not have a ladle but it does now.) &#128521;. We loved seeing the different sea birds that visited and watching the fish jumping. The sunsets are spectacular. Just sit back in the deck and enjoy. Beautiful house and location. This was the second year in the house and looking forward to our third next year. This house and the view was spectacular! It was absolutely everything we could have asked for and more!! Great views, wonderful lay-out, all you could ask for regarding kitchen, grill and hot tub!! Beautiful, In the 8 years we rented houses in Avon this was by far the best in all ways. Spacious, comfortable, sunsets,..... I could go on and on. The only thing that was disappointing was that the house was not available to rebook for next year. Wonderful home away from home! All the comforts and amenities you could ask for!!! !